No fashion week would be complete without a full disclosure of my handbag selection. Despite being in the AKA Hotel for The Daily Hospitality Suite for nearly three full days, I still managed to have plenty of handbag changes. For long stretches away from the office, I went with Rebecca Minkoff's MAB mini in persimmon - it's a wow color you can't miss. Alternatively, I also used the m. Clifford Designs Terrell Tote in black when my coat had enough going on without the need for a pop of color from my bag. For a fun evening affairs, or when I wanted to get extra attention, it was Bodhi's Safety Pin clutch - everyone always asks about it and I love the retro 50s vibe. For a quick coffee run it was my Vegan Queen wallet/clutch - great for holding lipstick and blackberry. And when all of my bag's weren't enough I turned to BagBorrowOrSteal. VERDICT: recession, smashesion I want this bag now! And for the first time, I borrowed jewelry too. As always, I have neglected to post for quite some time. But, my bag-a-licious life has been quite bag-a-licious and I've found that twitter is short and sweat so check me out www.twitter.com/pamelapekerman for regular updates!! I also just signed up for Tumblr, but I’m only in the beginning/orientation stage. And as always, I'm doing stories for http://www.bagtrends.com/. And, I'm going to work harder to let you know when a TV segment or bag story that I write is coming out. So, fashion week - madness!! I only went to one show (Michael Kors) this season because BagTrends was an official presenter at IMG's The Daily Fashion Week Suite. The media/vip hospitality suite was beyond amazing. We (me, Paula - my phenomenal assistant -, and Michelle - the creative director of BagTrends and my awesome sister-) met many great fashion editors, mingled with the celebs, chatted up BagTrends and more. I was so excited to give away a m. Clifford Renee clutch in black croco embossed. This clutch is a perfect shape, fits everything, has the luxury red suede lining, is made in the good-old USA, has the zipper dealing that's a key trend for spring, there are plenty of pockets and it also has a detachable shoulder strap. Ya, I'm obsessed with this bag and with m. Clifford ... and I'm not the only one. All the editors were flipping for this new line, as well as my personal Bodhi safety-pin bag - Bodhi is another one of my Names 2 Watch in 2009. The whole event was held at the AKA Hotel in Times Square. LOVE LOVE this boutique hotel. The staff is very friendly, the location is ideal if you're coming to NYC as a tourist - it's two block from Bryant Park and walking - yes I do it all the time - distance to Central Park. Come on people 15 short blocks down the fabulous 5th Avenue never killed anyone. It's a 20min walk, max. Anyway, so I recommend that. Also, I recommend Amarone Restaurant - they were one of the caterers at the Daily Suite. Yummy yum!! Well, that was how we spent most of fashion week - in a sweat hotel, with plenty of free food, nice people, talking about great bags and promoting our upcoming BagTrends GREEN Arm Candy Party. The pictures speak for themselves. It was a great week. What an amazing fashion week!! 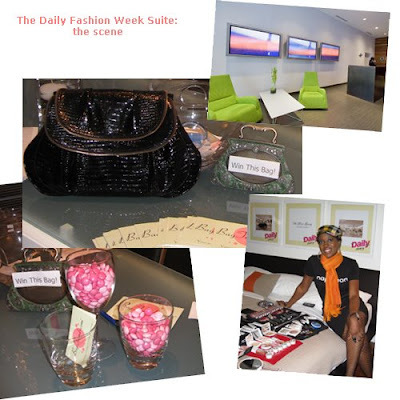 BagTrends was featured at the official IMG The Daily Fashion Week Suite. I'll be posting images, trends and celebrity scoop over the coming days. There will also be bag-a-licious show reviews on BagTrends.com. It's going to take some time to get everything up because most of the week was occupied with the suite and chatting up our upcoming BagTrends GREEN Arm Candy Party to visiting press and celebrities. For now, let me share an exciting giveaway we are doing with Elliott Lucca/The Sak. Two weeks ago, amidst the madness of planning my wedding and looking for a house, I decided it was time to at least attend one evening function. So, I hauled it to the city for The Saks 20th Anniversary Party. My pr gals, Andrea and Jill, did not disappoint. There was a lovely retrospective about the brand's history and the launch of the new sakrooots eco collection. Editors left with a fabulous The Sak Peace canvas tote filled with goodies: Confessions of a Beauty Addict book, Bliss Thermal Shaving Cream, Jet Blue Luggage Tag, Stila Lip Glaze Stick and Pencil Sharpener, 50% off James Corbett Studio, 40% off Wallett Cosmetics, 50% off Tommy Guns Salon, Cutler Daily Shampoo and Alison Raffaele Oil Blotting Tissues. One lucky BagTrends member will also win this bag. We'll choose a member next Friday, so subscribe now if you aren't a member. Good luck! A full review of the event, the fall 2009 Elliott Lucca and The Sak collections will be posted here soon.